QC Design School’s online courses provide you with a classroom-like education from the comforts of your home. Life can be hectic, and that’s why online courses can be completed on your own time and at your own pace. QC offers four home design classes that provide students with hands-on training and personal feedback every step of the way. Each online design course comes with full-color texts, video tutorials, plus customizable business forms and templates. You’ll complete theory-based AND practical assignments, and submit them directly to QC’s Online Student Center. Your tutor, who is an expert in the design industry, reviews your work and provides you with detailed audio feedback and a letter grade. Contact the Student Support Team whenever you need additional help or advice with QC’s design courses. Receive your professional certification upon completion of your course. When you enroll, QC Design School ships your design course materials by mail, including full-color textbooks, art supplies, assignment booklets, instructional DVDs, and much more. You’ll have easy, convenient access to everything you need to complete your home design course! Once you’ve finished a unit, you’ll submit your design assignments through the Online Student Center, and these will be sent directly to your personal tutor. Your tutor reviews your work and provides expert feedback within 7-10 business days! In their feedback, your tutor will identify areas of opportunity and highlight your areas of strength. You’ll review this advice to improve your skills for the next unit. With each assignment, you’ll build on the materials you’ve learned, to develop your skills as a professional home designer. 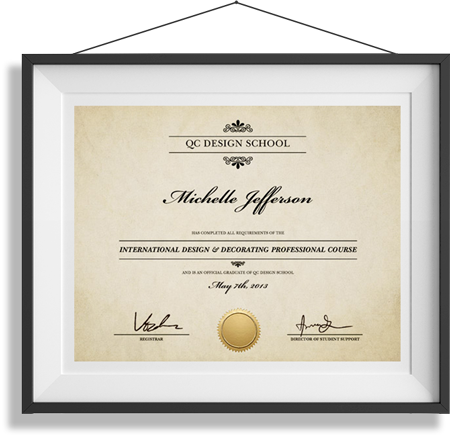 Become a Certified Design Professional with QC Design School! Once you have successfully completed all of your assignments and your tuition has been paid in full, you’ll be all set to graduate from QC Design School! Your certificate of completion will be sent straight to you so you can begin your exciting career as a home designer.